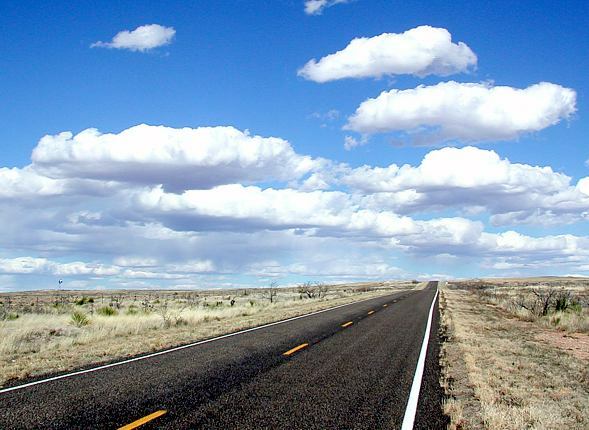 New Mexico's Highway 20 travels forty-six extraordinarily dry and empty miles from near Ft. Sumner to its junction with U.S. 285, north of Roswell. There are few buildings anywhere in view, and at least on this afternoon, only a handful of vehicles encountered on the entire stretch. This view from the side of the road looks back toward from where I had come. The intense blue sky is pocked with some late-winter clouds. Far to the left near the apparent horizon, a very remote windmill is barely visible.